Bestowing the gift of fire onto humanity wasn’t the smartest move by Prometheus. While he’s doomed to an eternity of “liver-picking” (definitely not going into detail on that), we have been using fire in more inventive ways than ever. Fire is a beautiful thing. Not only is it mesmerizing in its brilliance, the difficulty of mastering this fickle beast is both an art and a science. It’s no wonder why modern recipes focus so much on thermometers, cooking times and precision measurements in order to rein the capriciousness of flame. But one restaurant’s turning that on its head. Just a dash of gut feel, wood, charcoal, and pure, unadulterated fire. That is Surry Hills’ Firedoor. You would be forgiven to jump to the conclusion that Firedoor restaurant can’t possibly be pushing the envelope. After all, if there’s anything countless seasons of Masterchef and other cooking shows have taught us, it’s that exactitude, that attention to detail, is key to producing great food. So how exactly is it that this is accomplished going off the volatile flame? You can thank British-born Lennox Hastie for that, and he’s all about getting back to basics. 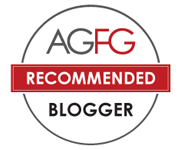 Heard of a restaurant called Asador Etxebarri? 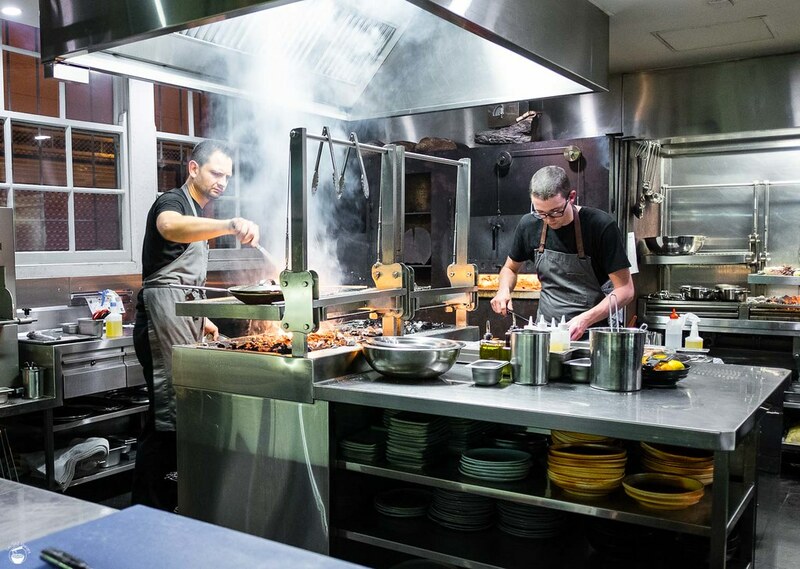 It’s a grill in the Basque region of Spain that happens to have the title of 13th best restaurant in the world. And yet, this restaurant is fully focused on wood-fired cooking. Hastie worked here for five years under the tutelage of master Victor Arguinzoniz. 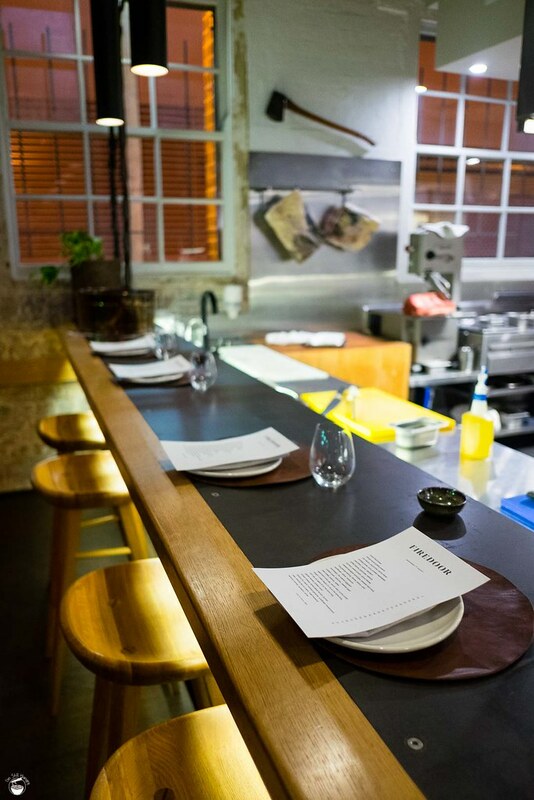 Now, he’s in Surry Hills, cooking up a storm fueled with Etxebarri’s experience. Combined with the beauty and quality of Australian produce, one can only imagine how delicious the results will be. Well, imagine no longer, for I made two visits to find out exactly that. Firedoor’s menu changes on a daily basis. They’re not grand, sweeping moves that flip the tables but rather it’s the little things – specific species of fish may change, or the vegetables paired with a certain dish. This isn’t an attempt to be flashy or to impress (or annoy) customers. Rather, it’s representative of Firedoor’s commitment to source the absolute best of the best produce on any given day. No matter what floats your boat, you can be assured that produce is most assuredly key. …you’ll find out soon enough what that all means. For now, let’s get started. 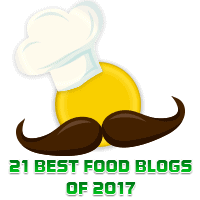 Note: this post is based on dishes from two visits. Blog post order will be from starters–>entrees–>mains–>desserts for sanity of succession. 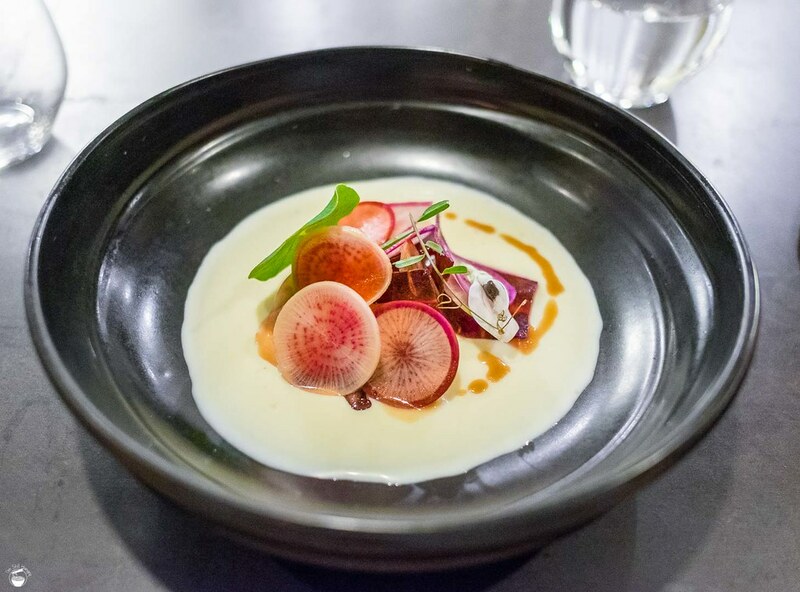 I have no idea what I did to deserve it, but on my second visit to Firedoor, I was provided with a complimentary dish of smoked jersey curd & pickled vegetables. Come now, I’m not that handsome, right? In any case, I wasn’t about to start questioning the restaurant’s generosity, and instead did what I do best – I tucked right in. Here’s an interesting tidbit about Jersey cattle you may not have known – they produce milk with the highest proportion of milk fats of any cow out there. On average, a full 6% of the liquid is fat, compared between 3-4% of most other breeds. This is why the most exceptional ice creams and cow-based cheeses often feature Jersey milk as a key ingredient. The Jersey curd we were served is fully reflective of this, tasting something akin to a sweet, gooey egg custard, full of creaminess. Rounding out the sweetness is a fair punch of acidity from its cultures. Overall, the flavour is quite subtle, which, while somewhat insipid, allowed a rich creaminess to be at the forefront. 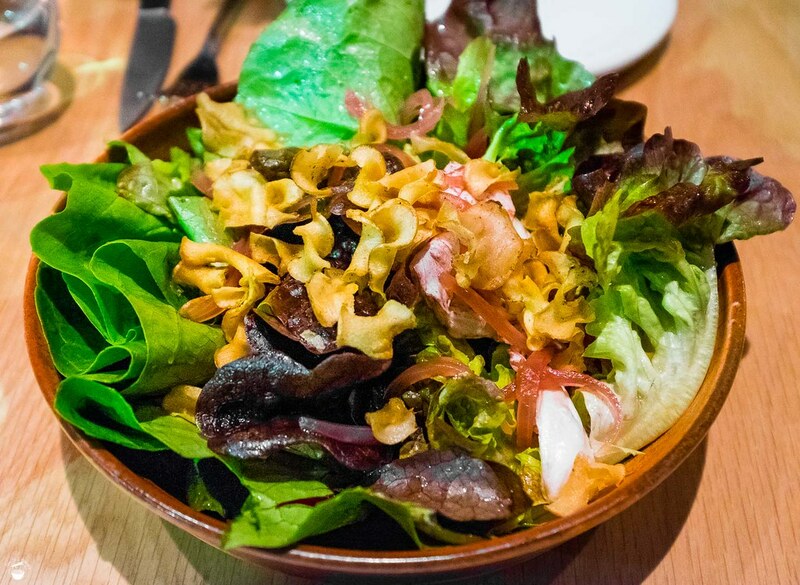 That said, it was more a dish on texture, rather than flavour – as exemplified and complemented by the assortment of sharply-pickled, very crunchy vegetables. A charge for bread? Sacrilege! But then, realise that Firedoor isn’t aiming to be a fine dining establishment, where bread service is gratis. On the plus side, one could make the argument that you’re saving on carbs? You wouldn’t want to though – while the bread here will cost you most of a tenner, it is well worth the order. Remember, Firedoor is all about the heart of the flame. Fire + dough = remarkable bread. Or is it? Yes, without a doubt. 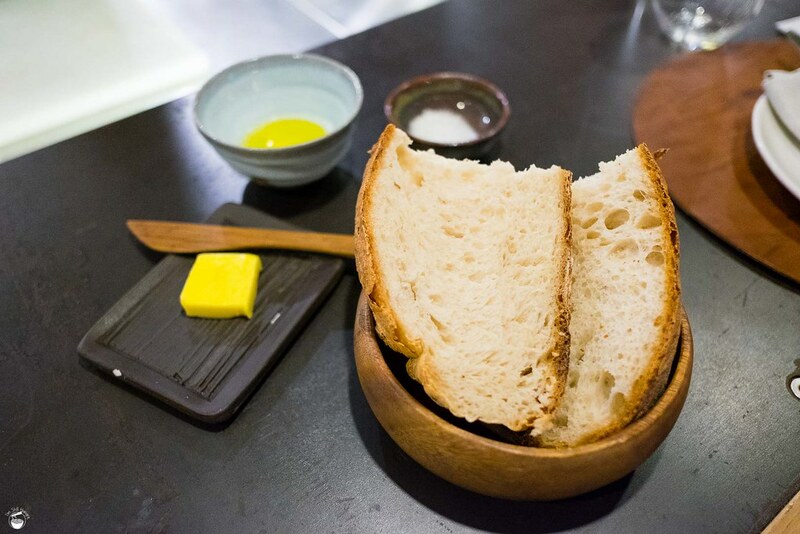 Firedoor’s bread comes in two fat slices of spelt sourdough, a small pat of ironbark-smoked butter, and eight week-pressed olive oil from Mudgee. It’s real good. A delectable, crusty exterior rich with a hint of smokiness and an abundance of crunchiness surrounds a chewy, doughy centre that’s so naturally flavourful, I forgot to use the butter or the olive oil. It just felt unnecessary. That said, the butter/oil do make their contributions – as fat is flavour! Naturally, it was also served warm, which is always the right way to go, as far as I like them. $8 well-spent. 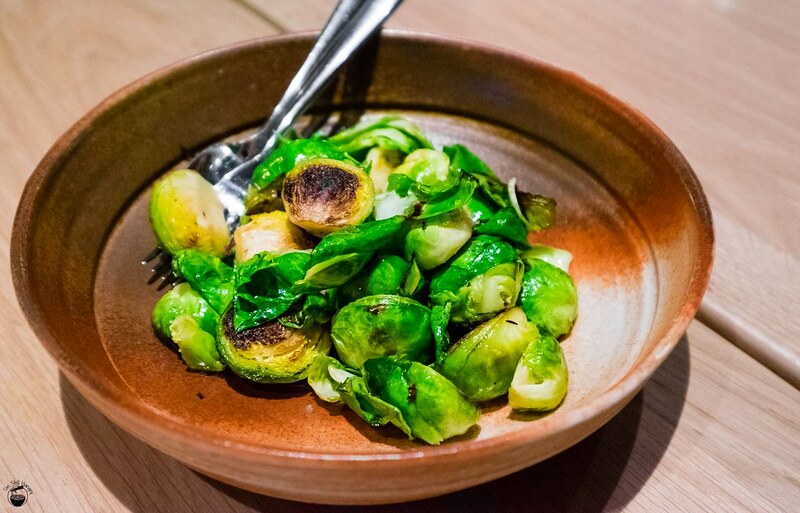 To this day, I don’t understand why Brussels sprouts get such a bad rap, especially among kids. They’re delicious! I would have happily engulfed these little mini cabbages, were it up to me. 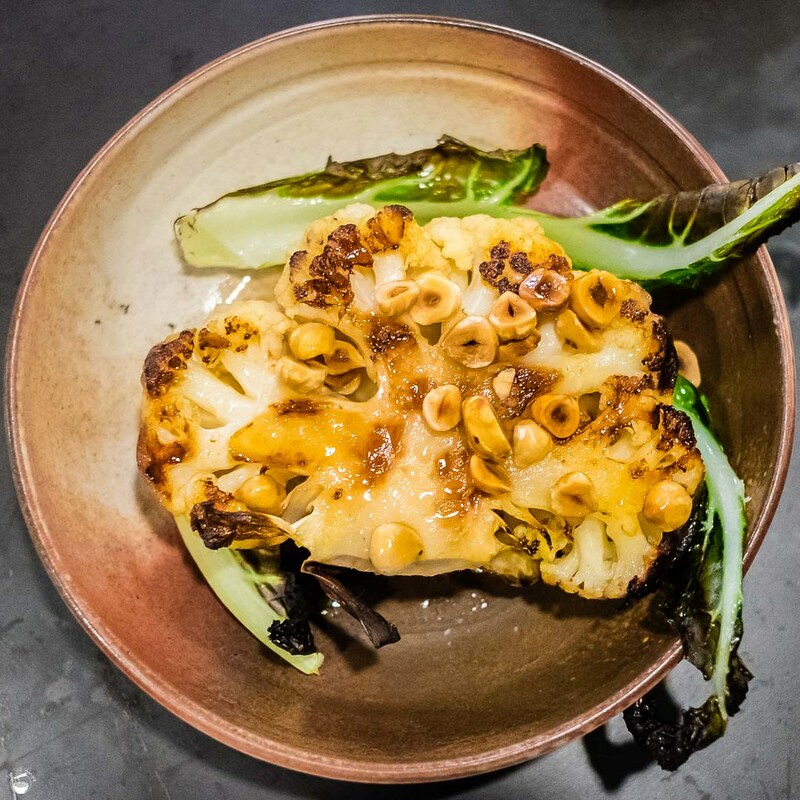 Firedoor’s version dishes up the mini-brassicas with a smoked ham hock, for just a taster of what Lennox’s fire-fed grill is capable of. Mmm, that oily vegetable crunch, the sooty char on the parts that have been kissed directly by the grill. A hint of beefiness from the ham. This is a strong showing of Brussels sprouts. Of course, in the end, it’s really just a cabbage, albeit a well-executed one. What really got me going was the pieces of ham hock underneath it all. Intensely flavourful, full of beefiness and saltiness, a perfect complement to the leaves, soaking up the juices of the ham. Unfortunately, we got what could only be described as a pittance of the hock. As can be seen in the picture above, there can only be so much meat underneath all of those sprouts. I think I got about 1.5 spoonfuls (between four people). This is probably best shared between two, if you actually want to eat a decent amount of meat. Probably the best entree I’ve had at Firedoor, but more hock, please! I never did master the art of swordsmanship (no joke, I did try – the replica that hangs off my wall proves this), but I’ve always been a maestro at eating swordfish. I don’t often see it on menus, so when I do, I tend to give it a go, despite the fact that I’ve had some truly subpar renditions. Then again, this is Firedoor – let Hastie work his magic. From what we were told, the swordfish is cooked under olive wood charcoals w/bronzed fennel, mandarin jus and mandarin wedges. I can’t even begin to pretend I could tell the difference the wood makes – all I could say was that there’s a classic woody aroma that wafts off of the dish. The restaurant’s full of it, and it’s heavenly. As for the swordfish itself, the flavour was regrettably quite flat, with the acidity and slight sweetness of the mandarin pushing through more than anything else. Its texture is quite rubbery and chewy on the inside, with a slightly crustier feel on the exterior. From that perspective, it’s quite nice. The crunch of the fennel helps to round out the textural stakes – I just wish there were more flavour to the dish. I’m not sure why the live marron dish is named as such – they are clearly not live when they arrive (am I missing something?). That curio aside, the dish itself is quite a stunner in presentation. They sure know how to make one tiny marron take up a lot of space. Alas, despite the beauty on the plate, I could not say the same in the tasting. 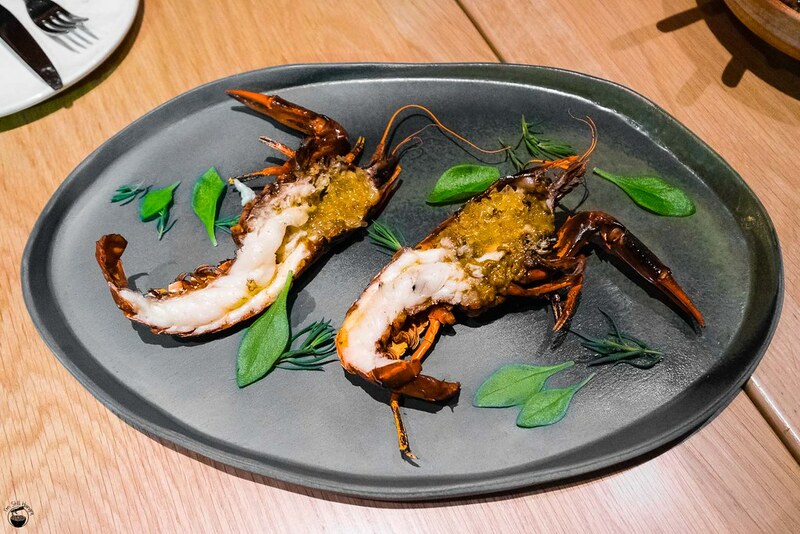 The marron flesh was, like several of the entree dishes above, lacking in the flavour stakes. The blood lime adds tartness, while the herbs provide a hint of fresh, “garden-like” aroma. None of that rescued the marron. Texturally, quite well-cooked, but both the engines of texture and flavour are required to keep this car chugging along. The fact that this was a $48 dish for about 100g of meat that doesn’t taste of much…ouch. Things are looking rather mediocre for most of the entrees so far. Is there no heat to the Firedoor flame? Don’t write this place off just yet. A cauliflower dish would seem to be quite the unlikely hero to rescue Firedoor’s case, but it is indeed the hero it needs and deserve. Technically a side dish, Firedoor’s rendition of this veg is to roast it, then put it over the grill to char up the surfaces and the leaves. It’s then drizzled with hot tallow fat that’s been split from the Jersey curd dish used earlier. I love this dish. Perfectly cooked cauliflower – crunchy, but not teeth-grinding to chew through. Soft, but not formless or muddy. A luscious flavour profile of beefy tallow, a sourness that sings, and smoky, burnt leaves that take it up a notch further – not to mention the nuttiness and hard crunch of hazelnuts. We were worried when the waiter warned us this would be a fairly substantial dish, given that it’s only half of a cauliflower. I wanted the whole darn thing. 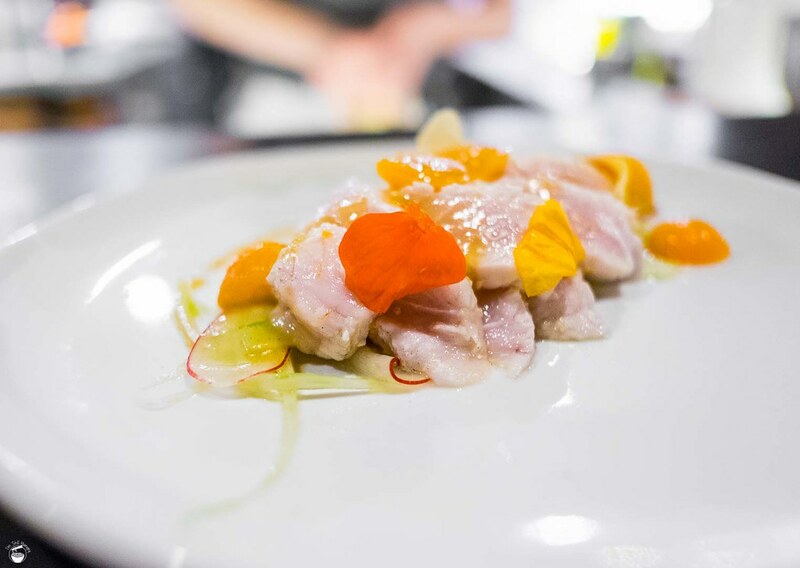 It is highly unlikely that you will find bluefin tuna belly on Firedoor’s menu any time soon, as the optimum season for this fish is coming to an end. We managed to get it while it lasted, because a) tuna belly on menu = instant order, and b) hello, did you read a)? It’s a bit weird that we didn’t actually get roman beans or parsley root with the belly as described on the menu, but my level of care for that is approximately zero. This dish is all about the tuna. 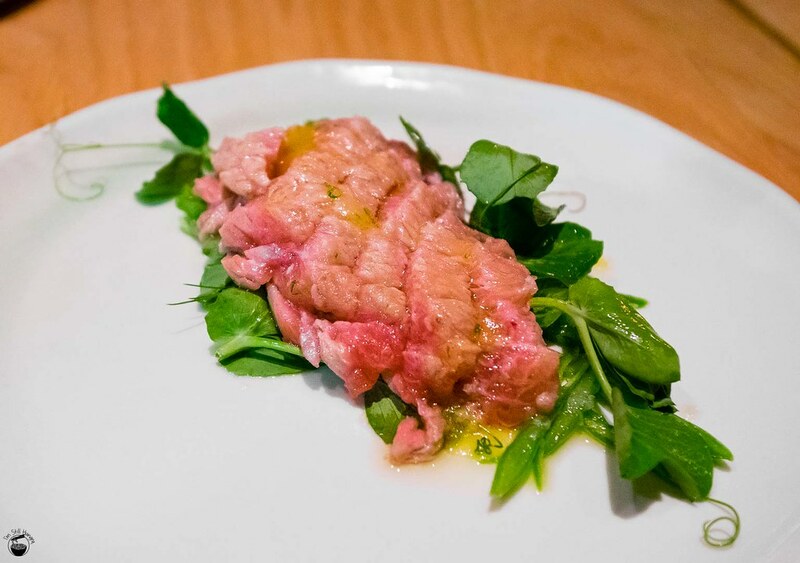 Here’s the thing about bluefin stomach – its fat content is so high it’s basically the MB9+ steak of the sea. It’s just exquisite, and oh so guilty. A tad lamentable that there was a slight lack of flavour (oops, here we go again), but the fattiness and natural sweetness of the fish was more than enough to retain my recommendation – assuming you find it on the menu. Done and done, but do share – this one’s fairly hefty to take on by oneself. It’s time for Firedoor to pick up their main game – appropriately, with the mains. 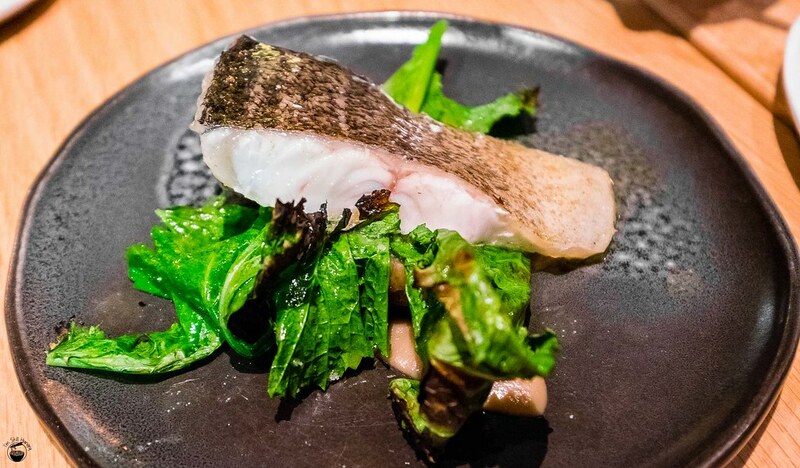 While entrees were a bit of a roller coaster, these bolder meats lend themselves well to the inferno, such as this Murray cod. Somehow, Hastie’s able to keep the inner flesh astonishingly tender while simultaneously delivering an alluring smoky, aromatic skin. Once again, a good dish at Firedoor means one thing: I wish there were more. Before we knew it, the fish and its accompanying charry greens were all but an empty plate. Let’s discuss cheeky. That is, beef cheeks. Firedoor’s beef cheeks. Whilst we ordered only one of every other dish to share amongst the four of us (1st visit), our server highly recommended us getting two serves of this dish. I thought that might be a bit much, but not willing to risk a wrong move, we complied. It was so good that we did. As far as good beef cheeks go, these are pretty much king of the hill. Ultra-soft flesh, easily broken apart by even the flat end of a spoon, the textures of these cheeks is just marvellous. The fried garlic on top add a strong, vampire-slaying flavour boost. As far as beef cheeks go, I’m already high and away on cow 9. Semolina gnocchi? Nettle puree? Oh yeah, I suppose there was a bit of that in the dish (very little, to be sure), but they’re simply distractions from the main event. Those buttery folds of beef is where all the cool people are at. 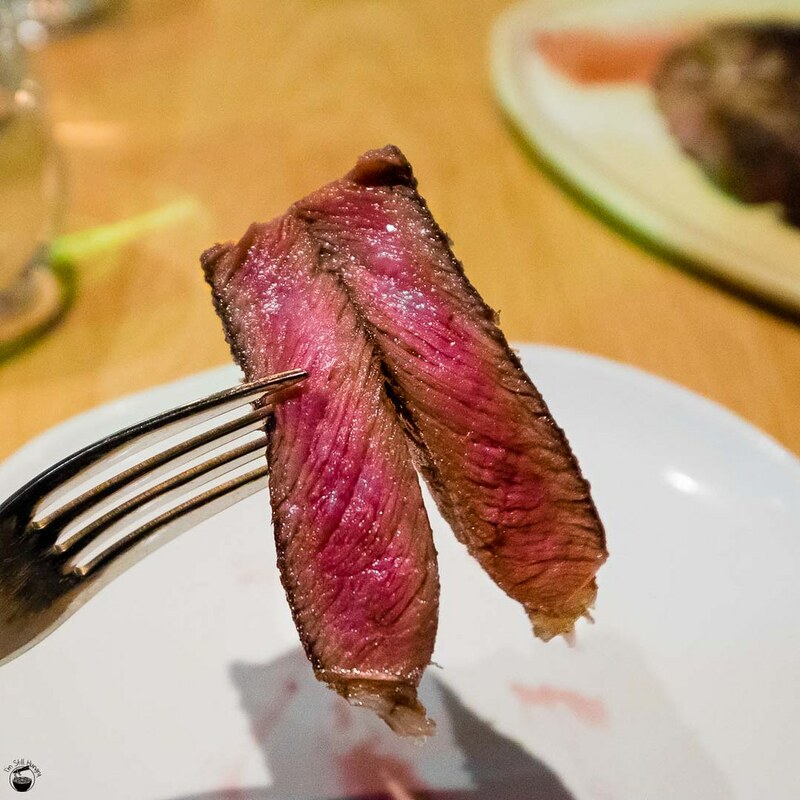 Having had the beef cheeks on my first visit, I had to resist reordering them on my second visit to make room for the aged lamb rump cap that’s been tempting me since the beginning. While I miss the beef cheeks, the lamb is no less impressive. It’s done medium-medium/rare depending on the cut. Very chewy, very flavoursome, full of sweetness and that beguiling pungency that only lamb meat exudes. 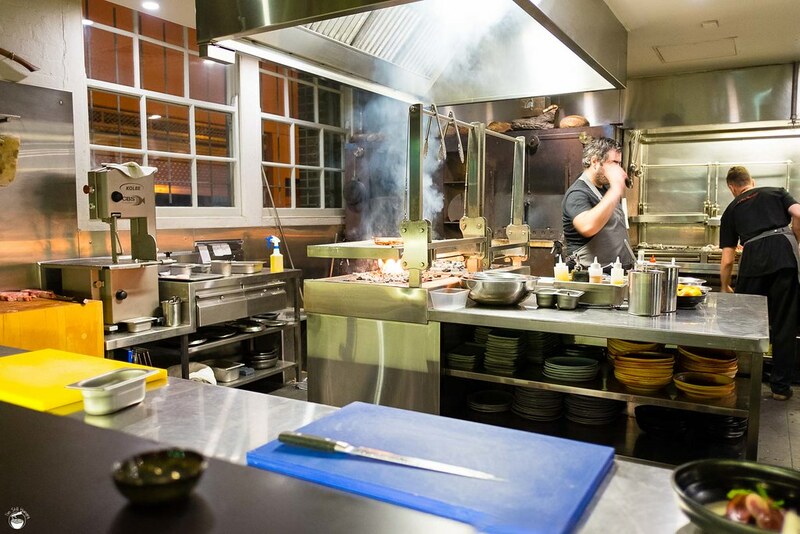 Firedoor’s wooden treatment is in effect here as well – smoky aftertastes with each and every bite. 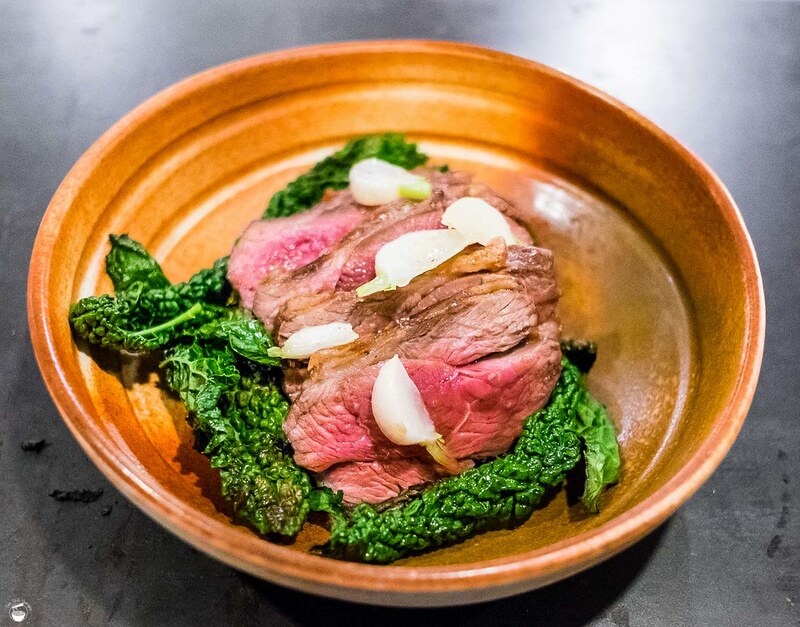 To balance out the density and richness of the meat, plenty of crunch elements are provided in confit turnip, turnip leaves, as well as crisped cavolo nero. These veggies had a sweet & sour flavour profile, which I suspect is to cut through the richness of the lamb. It works. Beef cheeks or lamb? 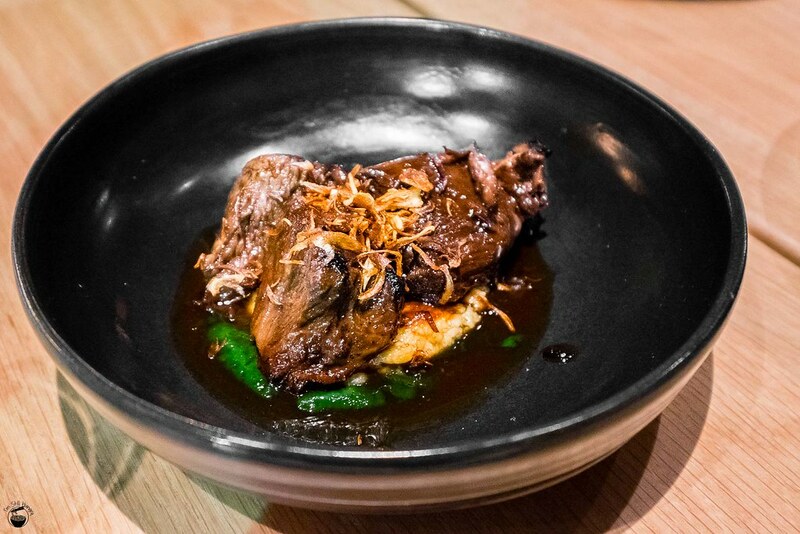 I’ll have to give it to the beef cheeks, but if your appetite is one to boast about, by all means – get both. But all that, all of the above, are but mere shadows when compared to the real deal. Here it is, ladies and gentlemen. 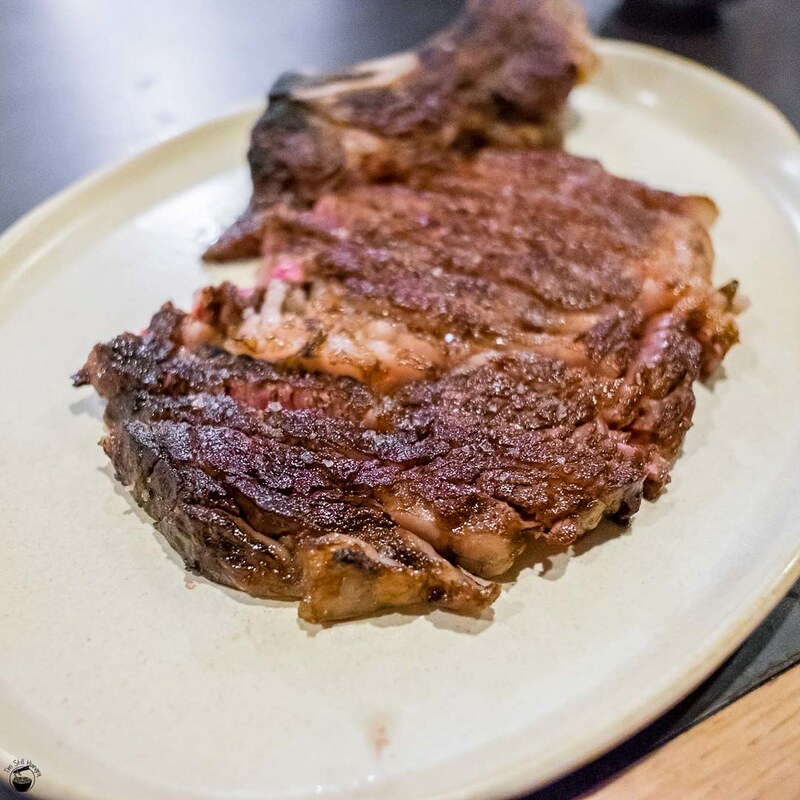 I present to you Firedoor’s piece de resistance – the dry aged rib on the bone. If you order this dish, your meal will cost much more than the price guide I gave at the beginning of the post, hence the *. $138 for steak is a tough pill to swallow, but I think you already know where I’m going with this. This is an expensive process – it results in a lower actual amount of muscle mass, and coupled with the extensive refrigeration costs required, it’s no wonder that aged beef is such a pricey commodity. Phooar, so much talk, but is there any walk? As far as red meat goes, I think I’ve found my best cut(s) of 2015. It is remarkable. That texture, that depth of flavour, that incredible sense of satisfaction with each and every bite. This is beef taken to one of the highest levels of cooking. Similar to a beef dish I had at Brae, it is exceeding difficult to even try to describe a medley of flavours that’s so complex. At once, it’s beefy, salty, pungently cheesy, sweet and fatty. It’s all of those, but on the whole, far greater than the sum of its parts. In terms of texture, it’s superlatively tender on the inside, with a brilliant, smoky and carbonised crust. The meat is roughly 30% fat, which may be artery-clogging, but if I was going to put anything into my bloodstream – this would be it. After all, fat is flavour, and also texture – beautifully succulent. You know it’s a brilliant piece of beef if no sauce is needed. If I had to nitpick one aspect, it would be that the crust is a bit too heavily salted. The beef’s natural flavours are bold enough as is. Regardless, every visit to Firedoor must be accompanied by this dish. I cannot have it any other way. Sure, it’s expensive – but the quality is remembered long after the price is forgotten. There’s a pretty wicked salad that also accompanied the rib, which does a good job at absorbing some of the bovine hit that is the heaven that I just ingested. Don’t forget that it exists! I know I was certainly far too distracted with that beef to pay attention to my greens. Speaking of green, let’s talk dessert. Something sweet to round off the meal is pretty much mandatory at this stage. It’s no secret that many Asians, myself included, are fans of matcha. Heck, my favourite cafe of 2015 is all about the green stuff. I’ll be honest – I was a bit surprised to see this tea powder feature on Firedoor’s menu, as even now it’s still more of an Asian sensation. I’m pleased to see it on more and more Western menus. Firedoor’s rendition is a decent attempt at capturing the essence of matcha. 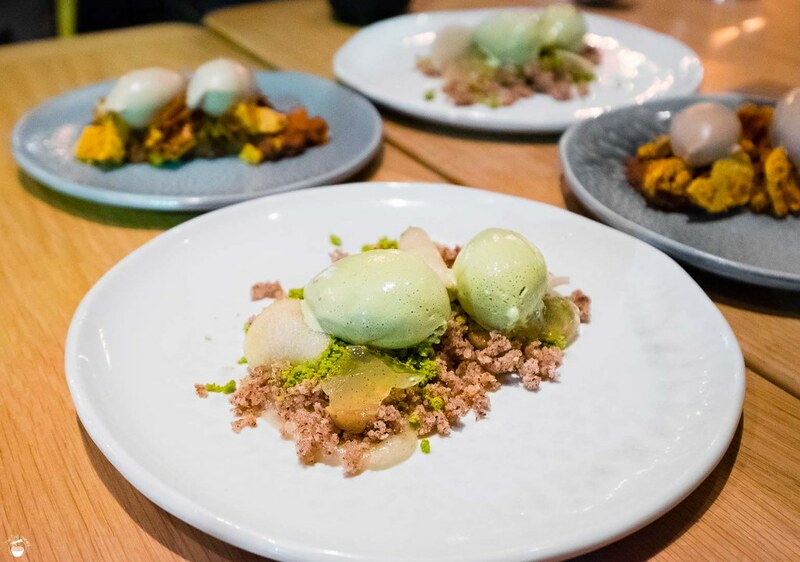 The ice cream is subtly sweet, refreshing and creamy, while the pieces of pear and hazelnut & matcha crumble add several layers of crunchiness. There’s also a bit of a pear puree at the bottom, and some sort of pear(??) jelly. The downside? The matcha ice cream needed to have a far stronger matcha kick. This is a common criticism of matcha-based desserts that Firedoor’s does not escape. The unique astringency of matcha is what makes it go so well with desserts. All in all, a nice one, only decidedly average given the relative quality of its savouries. 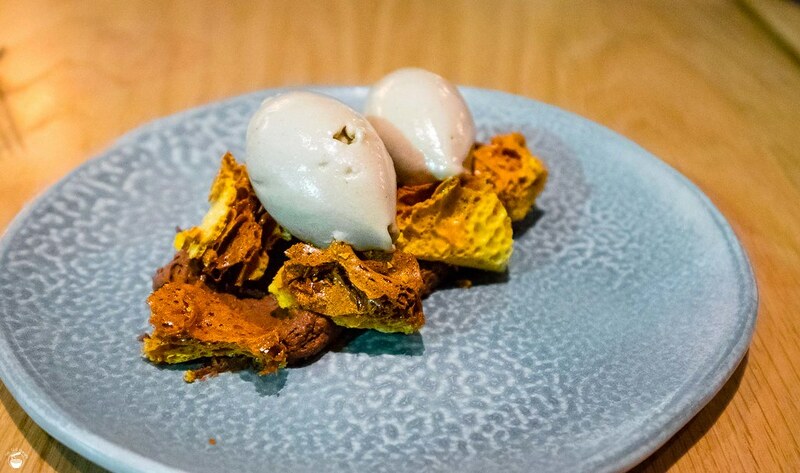 The only other dessert available to us on our first visit was the banana ice cream w/smoked ganache & wildflower honeycomb. While the banana ice cream is essentially all the best bits of banana in ice cream form, the smoked chocolate ganache was incredibly bitter. I could also detect much of the smoking that, while working beautifully with the savouries, was more impediment than assistance here. Unfortunately, this threw off the balance of the entire dish, which is a real shame as the rest of the dessert was well-done. That includes the sweet honeycomb – as sweet and delicious as they come. Okay, so the desserts are middling at best. That’s alright – you can always go somewhere else for your sweet hit, or just hit up another savoury. After all, that’s why you’re here, right? Firedoor is a restaurant that’s all about the sweet spot being the savoury spot. Sure, the entrees are a bit of a slow start, with the desserts being an unimpressive finish. But it’s hard to argue with the finesse and quality of the produce and cooking techniques used for the big meaty hits. Indeed, the food in this section of the menu is so good, I made that second visit despite my misgivings about the entrees and desserts. It’s just that damn good. Do yourself a favour – grab that cauliflower, order the beef cheeks, and by Jove – put a plate of that dry-aged rib on your table. I’d love to hear your comments about this place – whether you’ve already been, or are raring to go. I have a new scoring system! Read all about it here. Most important takeaway – three separate scores for food, service and ambiance to give the final score. The new system is not compatible with any score given prior to 11/11/2014. Firedoor was more flicker than raging fire for us. Went there in July and needed to take a out a small loan to fund the meal. I am happy to part with good money if in return I get amazing quality, decent sized portions and skills that I am unable to replicate at home. While quality was good, size was not. I couldn’t go the ribs, because I slow cook my own every Sat, and I couldn’t justify the stratospheric cost, as aged as the beef may be. I felt like someone was having a laugh at our expense, gimmicky food palmed off as high art ……hello Banksy? (btw I love Banksy, he is a genius, but I just felt Firedoor was too try hard). What made it a bitter pill for us was the meals were all served in under hour which made me feel like I had been to the world’s most expensive yumcha. Maybe if the meal had a more languid feel I could justify the exorbitant prices, because the enjoyment factor goes down considerably when one is rushed. On top of that, wine is also very expensive (but really amazing) and the waitress whisked away my 1/3 glass full before I could quaff it. As for the cauliflower, ours was tough as boots and Ester does a more superior version. 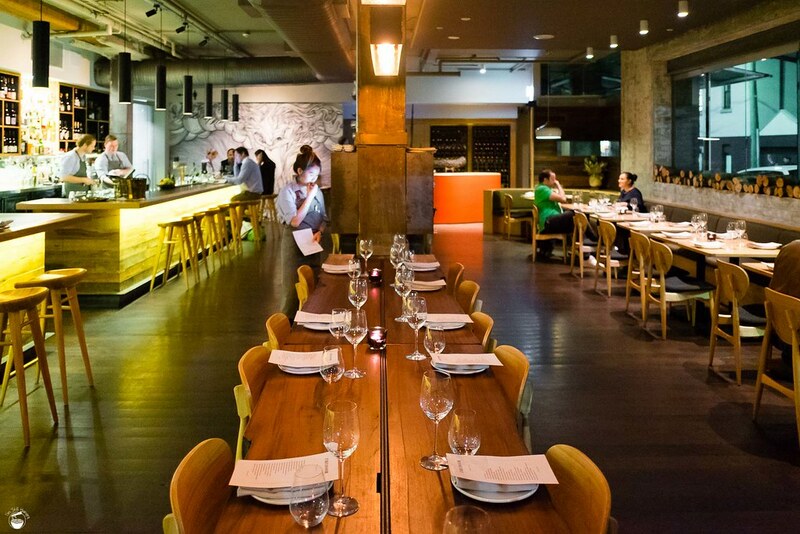 Actually, I had a far superior dining experience at Ester at the beginning of the year at a third of the price. Hi Kristy, shame you didn’t have the same quality experience I did on my two visits. That’s the thing with food, isn’t it? 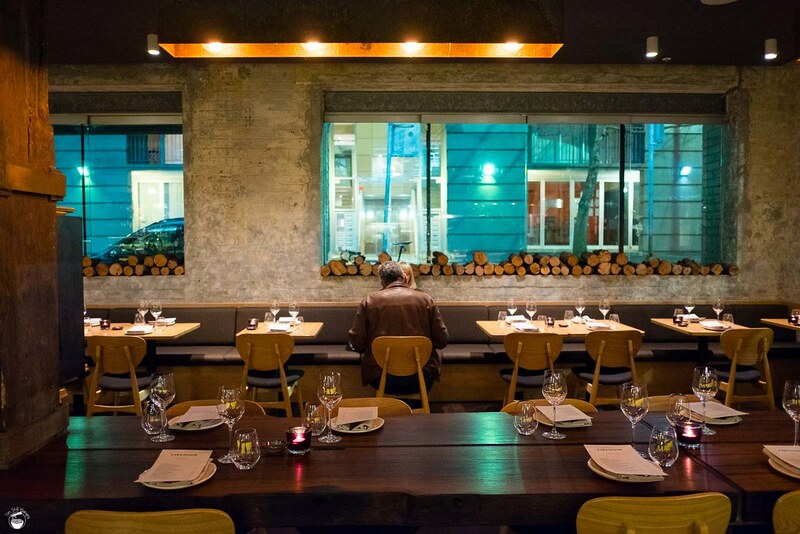 I haven’t been to Ester yet, but I have a good feeling about that place – definitely on my go-to before this year is out! holy moly that steak looks and sounds freaking amazing! This steak is on fire. It’d be a missed-steak if you don’t order the beef. The cauliflower dish reminds me of the one at Ester, which i really enjoyed! 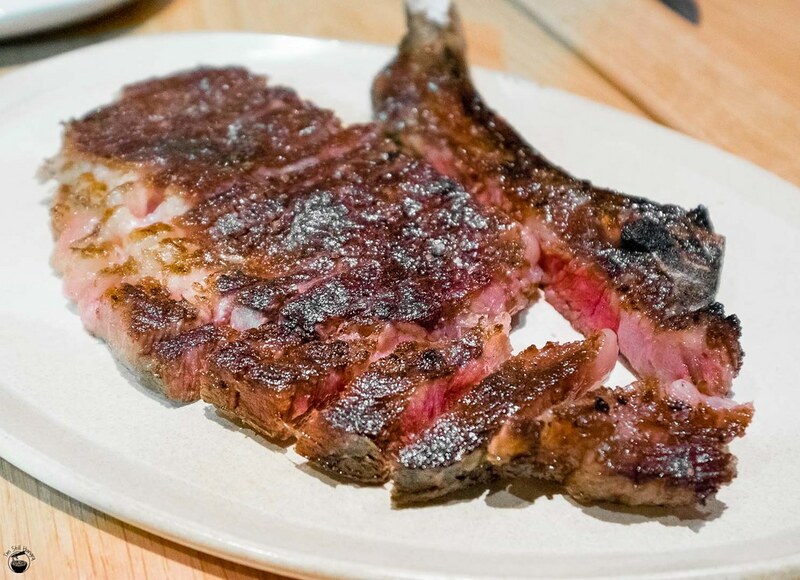 Also, have you tried the 1.1kg dry aged ribeye at Cutler & Co.? I think you’ll love that too. Really juicy and tender! Cauliflower seems to be making big waves these days! I’ve yet to visit Cutler & Co, but I will be when I revisit Melbourne in September. Duly noted on the meat! How good is that rib eye on the bone! Pretty much mouthgasms with each and every bite! That cauliflower dish reminds me of the one at Ester, which I really enjoyed! Also, have you tried the 1.1kg dry aged angus rib eye at Cutler & Co.? I think you’ll like that too..